Spartan Swim Club member Catie Boggs will be participating in the USA Central Zone Championships in Rochester, Minn. on August 3. Boggs qualified for the event in the 50-yard breaststroke. The Spartan Swim Club stands alongside Catie Boggs (center) during the Cupcakes for Catie fundraiser on Saturday at the Roy Rogers Esplanade. Catie Boggs stands by her cupcake stand on Saturday morning. In order to partake in special events such as the USA Central Zone Championships — which Catie Boggs qualified for — an assist from the community is usually required. Communities from across the area certainly did that on Saturday morning as individuals came out to the Roy Rogers Esplanade in droves to support Boggs and the Spartan Swim Club — to the tune of $1,025, as a matter of fact — in an effort to help pave the way for Boggs to enjoy her latest accomplishment. For the 10-year old Boggs, the support of all of those who showed up will certainly mean a great deal to the talented youngster going forward. That support, according to Spartan Swim Club team manager Hope Bruch, is one that is well deserved. Boggs — who starred for the Wheelersburg 9-10 year-old softball program by collecting an astronomical .808 batting average en route to leading the 9-10s to a state championship — could be a better swimmer than a softball player, and that’s saying something. Need proof? Boggs even defeated Bruch’s son, Jeremiah, in several practice races against each other — and Jeremiah is 15 years old. Over the course of the season, Bruch said that the goal for the talented multi-sport standout was to simply get her times down, as is the case for any swimmer. However, Boggs not only got her times down enough to qualify for the Junior Olympics, but blew past the competition in the 50-yard breaststroke as Catie qualified for the USA Central Zone Championships in Rochester, Minn — all while getting two to three times less practice time than her competition. She will be one of just 164 swimmers — and 34 10-year olds — to represent Team Ohio when she takes to the water and competes in the 50-yard breaststroke on August 3. With Boggs quickly making a name for herself through her hard work, it’s no surprise to see various individuals coming out in support of the strong-willed competitor. 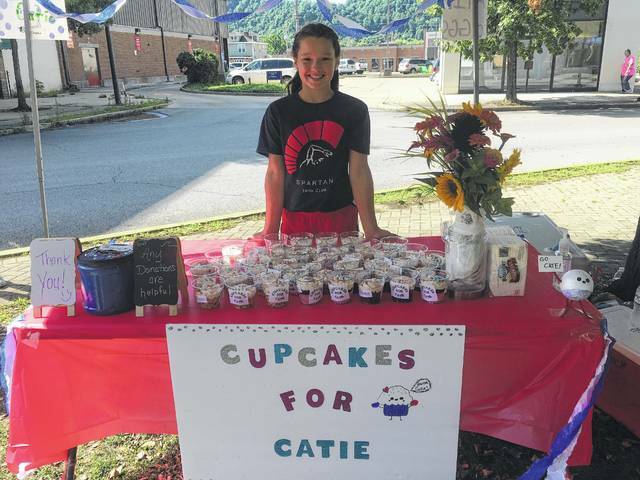 One man even brought a Saturday, July 28 edition of the Daily Times for Catie to sign at the cupcake fundraiser, and the fundraiser itself raised the $1,025 total in just three hours. What makes Boggs’ mentality so impressive at a young age, however, is her ability to keep thinking about what is next. Ultimately, Catie’s goal is to qualify for the Olympics. And with the 2028 Olympic Games officially being held on American soil in Los Angeles, it certainly would be a neat storyline. For now, however, Boggs is just satisfied with being able to pursue one of her greatest passions.